10th Mar The Cider Express (Hereford-Severn Tunnel-Bishops Lydeard) Pontrilas, Llanvihangle, Cattybrook, Bristol Temple Meads. 28th Mar The Severn Valley Wanderer (Bristol-Hereford-Kidderminster) Narroways Junction, Bristol. 1st Mar The St Davids Day Special (Swansea-Severn Tunnel-Badminton-Paddington) South Morton. 31st Mar. The Royal Duchy (Bristol Parkway-Penzance) Beam Bridge, Rattery, St Germans. 17th Mar The King Circular (Solihull-Didcot-Kemble-Cheltenham-Kidderminster-Tyseley) Banbury. 12th May The Bath And Bristol (Willesden-Newbury-Bristol-Swindon-Didcot) Crofton, Wantage Rd. 9th Jun The Cambrian Coast Express (Shrewsbury-Wolverhampton-Solihull-High Wycombe-Paddington) Cropredy, Ardley. 26th Aug The Torbay Express (Bristol-Kingswear-Bristol) Cockwood Harbour, Stoke Cannon. 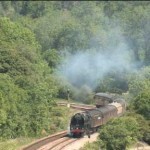 5th May The Chiltern Steam Express [Moor St-Marylebone and return) Knightcote, Kings Sutton, West Wycombe. 19th May Two Halls To Bristol (Solihull Oxford-Swindon-Badminton-Bristol and return) Wantage Rd, Oxford. 22nd Sept. SVR Gala Shuttle (Bewdley-Snow Hill) Bewdley, Kidderminster. 3rd Nov The Pannier To Ironbridge (Tyseley-Birch Coppice-Walsall-Ironbridge-Walsall-Tyseley) Lea Marston, Kingsbury, Birch Coppice, Kingsbury Junction, Minworth, Aldridge, Shifnal, Coalbrookdale, Albrighton. 28th May The Devonian (Bristol-Taunton-Plymouth and return) Beam Bridge, Tiverton Junction, Dainton, Rattery, Hemerdon, Dainton, Stoke Cannon. 30th May The Cathedrals Express (Victoria-Reading-Cranmore and return) Fairwood Junction, Westbury. 1st June Light engine move. Yarnton. 1st July The Bright’n Breezy (Bristol-Salisbury-Preston Park, Brighton-PrestonPark) Upton Scudamore. 17th Feb VSOE Hampshire Luncheon Special (Victoria-Andover-Southampton-Winchester-Victoria) Deane, Micheldever. 14th Mar VSOE Special (Victoria-Staines-Salisbury-Westbury-Newbury-Staines-Victoria) Red Post Junction, Stockton, Stert. 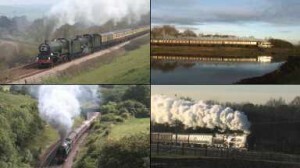 21st Apr VSOE Special (Victoria-Didcot, Oxford-Victoria) South Stoke. 30th May VSOE Special (Victoria-Westbury-Victoria) Bishopstrow, Westbury. 8th Jul The Waterloo Sunset (Waterloo-Salisbury-Southampton-Eastleigh, Poole-Southampton-Winchester-Waterloo) Deane, Grateley, Petersfinger Salisbury, Poole Park, Parkstone, Micheldever, Basingstoke. 11th Dec VSOE Surrey Xmas Luncheon Special (Victoria-Guildford-Victoria) Shere. 28th Oct The Cathedrals Express (Clapham Jc-Honiton-Exeter, Westbury-Salisbury-Clapham Jc) Andover. 11th Dec The Cathedrals Express Carol Concert Special (London-Salisbury and return) Egham, Winchfield, Salisbury. This entry was posted in Video, Video Catalogue. Bookmark the permalink.